There are other web pages on rotatable flags out there (W7IUV, N4IS, etc), and others on variable-termination antennas (WA1ION), but I wanted to document my success using this antenna from a very small lot. There aren't a whole lot of places where this antenna won't fit, and it really does exhibit an improvement. There is a measurable effect of nearby objects, and more work to be done on that front, but it generally outperforms my transmit antenna on RX. The rotating flag mounted on a stand in the driveway. The flag measures 7 feet x 14 feet, which is about 1/2 the size of the flag described in ON4UN's Low Band DXing and half the size of the flag built by W7IUV. The flag is built with fiberglass fishing pole supports and a bolted aluminum plate and angle hub,very much like my Moxon hub. In fact, I used the Moxon hub to support my flag last season. I'm fairly certain this construction would be good for a much larger flag. 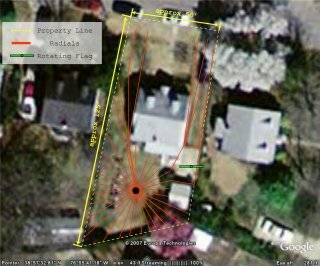 If you purchased 20 foot B'n'M poles, I think it would support a full size (30x15) flag. In this particular case, I am using parts from two 16 foot B'n'M poles. The stiffer large diameter sections support the weight of the flag and the smaller diameter sections are sufficient to hold and spread the bottom. 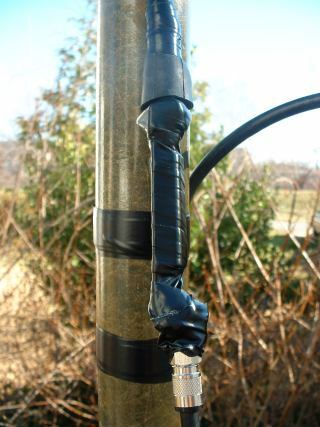 Common mode isolation is really important with such low gain antennas, so I've tried very hard to decouple the feedlines and other conductors from the antennas. Others have used Vactrol terminations for these sorts of antennas, basically a light-dependent-resistor close coupled to a light source, which would probably be sufficient, but I decided to use some fiber optic cable I had lying around to couple the light from a bright white surface mount LED to the Cadmium Sulfide photocell. The photocell is paralleled with a 2kΩ noninductive resistor and I can adjust the termination from 650 ohms to 2000 ohms using the circuit in the upper right of the schematic to drive the white LED. Thanks to Lee, K7TJR for discussion about the driver circuit. It uses a photocell in the feedback path of an op amp to make the resistance change more linearly with voltage, which makes the adjustment of the knob in the shack easier. The fiber optic cable runs all the way down the fiberglass mast, leaving only the coax as a stray conductor. 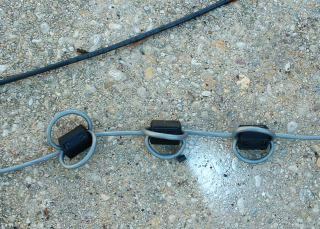 To make absolutely sure the coax was decoupled, I added a SECOND transformer inline. 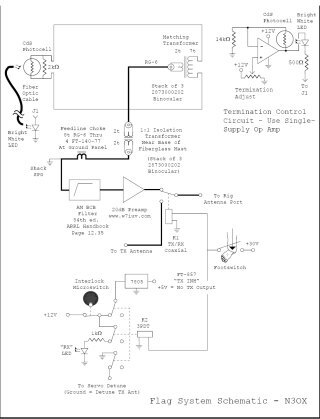 The isolation transformer has the same construction as the main flag transformer, just with a two turn secondary. For the sake of absolute overkill, I also added chokes on the rotator cable and a feedline choke at the shack single point ground panel. Geoff, G3XGC asked me if such decoupling was necessary. I haven't tried to test it systematically. 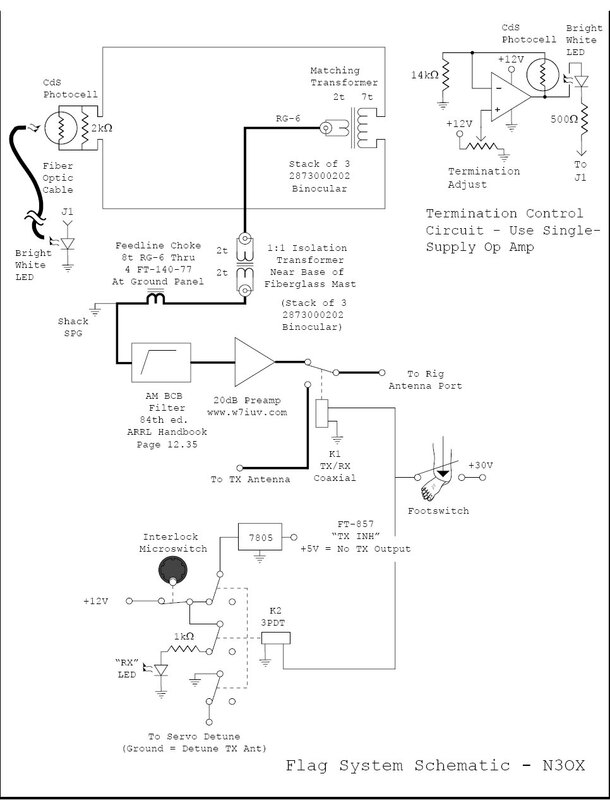 The isolation transformer may some loss, though, and that may cause a minor problem. More on that in the preamp discussion. Feedline choke at the ground panel and chokes on rotator cable. 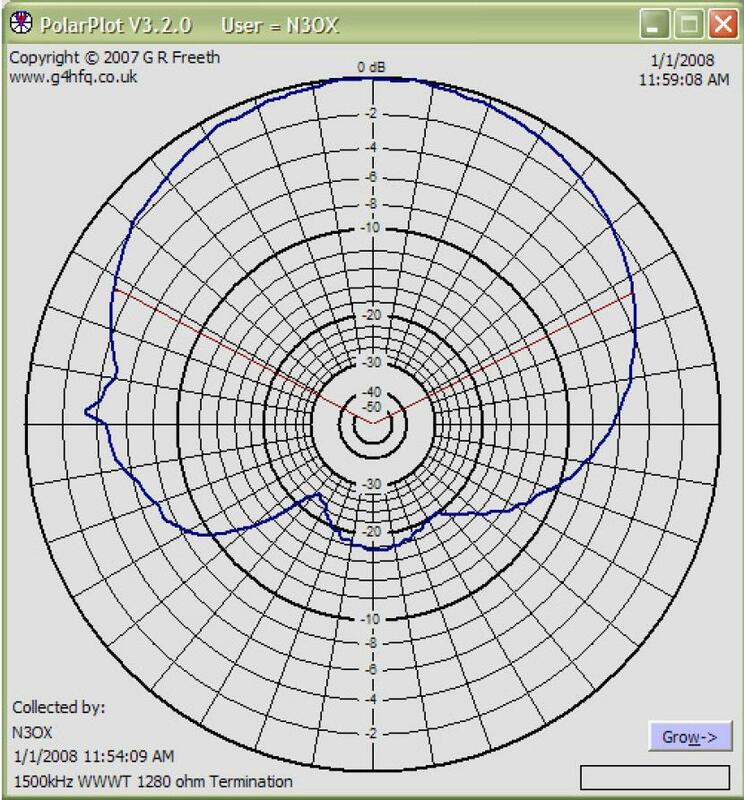 I used eight turns of RG-6 through a stack of FT-140-77 cores for the feedline choke and a few turns through three snap on #31 material cores on the rotator choke. I'm fairly certain I'm beyond the point of diminishing returns with feedline choking but I think one of the reasons I like this antenna is probably that it doesn't pick up very much noise from the house. The rotator is an old Alliance HD-73 that Dave, AA6YQ gave me a long time ago. I'ts a nice addition after spending a season going outside to manually rotate the flag. Flag Control Central - rotator and termination controls. 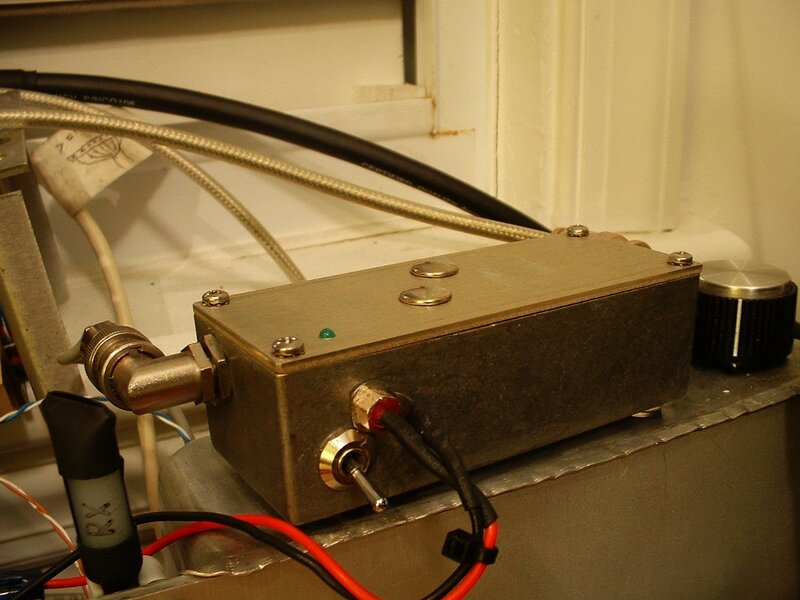 The low gain of the antenna requires a preamp. Even with 20db preamplification the noise level on 160m just barely goes up when you plug the antenna in. The preamplifier is described on W7IUV's website and uses a 2N5109 transistor I got from Mouser. It's really a nice preamp and very easy to build. I was discussing gain with WB6RSE and he wondered if my preamplifier was sufficient. The small flag has lower than -40dBi gain, really extremely low output. 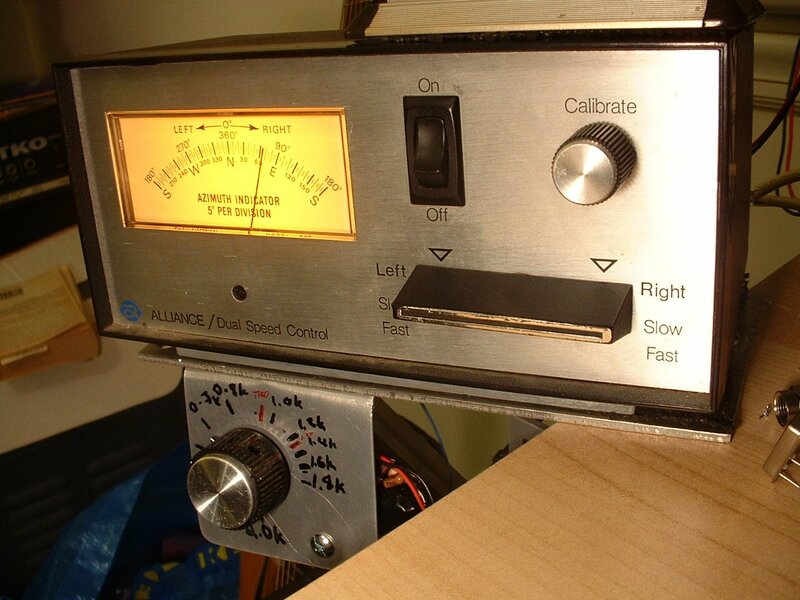 I really have to recommend that you test your system to see if you have enough gain, especially if you're going to add an extra isolation transformer or long runs of coax. The test is simple. During the day (midday is best with maximum D-Layer absorption) go down to 160m with the narrowest filter you'll be using. Point your flag in the quietest direction you can find and disconnect and reconnect it a few times. Do you hear the noise go up when you connect the flag? If not, you don't have enough gain! If you don't have enough gain to overcome preamp noise and internal RX noise, you'll miss weak ones on a quiet band. The best solution if you fail this test is probably to build a bigger flag. 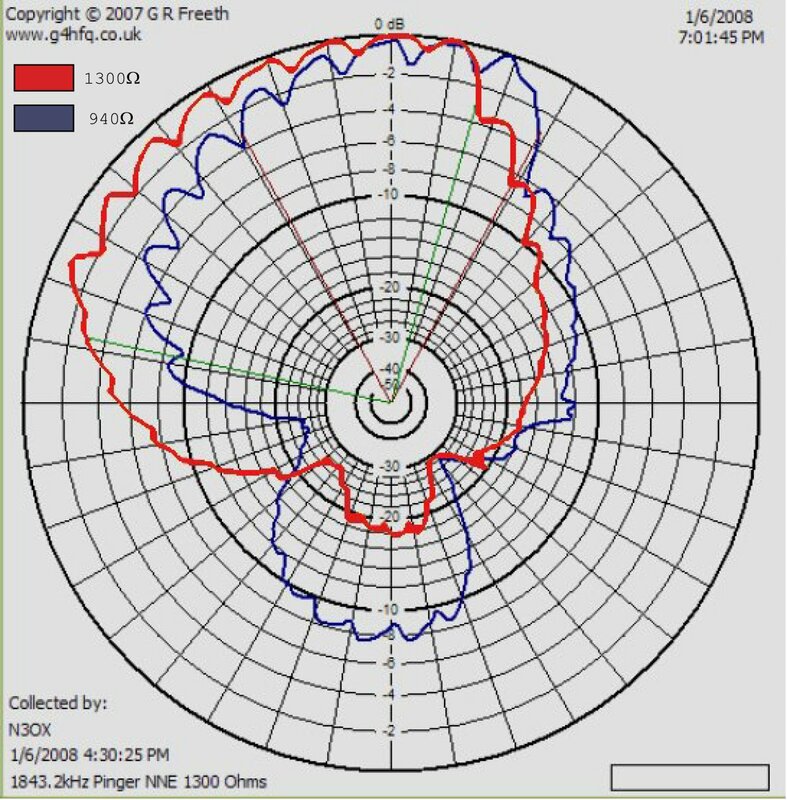 I have a high daytime noise level on 160 and I bet a lot of people in tightly packed suburbs will have the same. I can hear the noise increase during the day through a 300Hz IF filter followed by a 60Hz audio DSP filter, which is often what I use. Since local noise is highly variable and may just bless you with shutting off for the night here and there, you should probably build the biggest flag you can get away with. 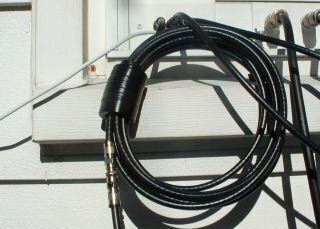 You could also use more than one preamp but more raw antenna gain is a cleaner way to do it. 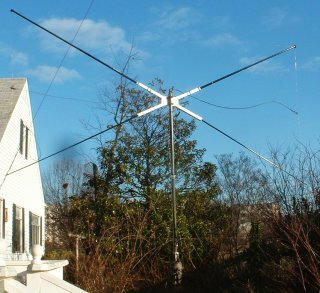 I've never had a situation where I couldn't hear an increase in the noise floor upon connecting this antenna, but it's maybe too close for comfort on 160m, and I may try a bigger flag in the near future. I don't think I've missed anything by limiting on receiver noise... after all, I don't have the sort of location like W8JI does where he can hear noise increases toward neighboring towns, but don't take chances. Buy the longer fishing poles and build the bigger 14ft x 29 ft flag if you have the room to swing it! I'm using a radio with no RX input, so I needed a relay system to switch back and forth between antennas. I decided to use a footswitch to eliminate timing issues, and I wanted a way to keep from accidentally transmitting into the preamp. The footswitch switches both a coax relay to change antennas and a 3PDT relay for control switching. 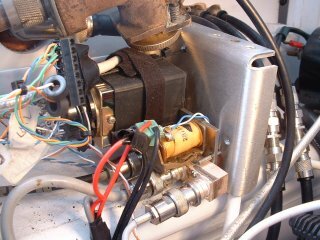 One set of relay contacts puts a resistor in parallel with the knob on my servo controlled antenna band switch, putting it a half-position off to detune the antenna. When that circuit is opened, the motorized switch moves back to the connected position for transmit. The other sets of contacts applies a regulated +5V to the FT-857's Transmit Inhibit pin and switches a little LED for RX indication. That 5V and an LED are activated by an interlock switch on the antenna switch that selects the preamp port. I had several blown 2n5109's *anyway* with this setup. It seems that my foot-key timing is not sufficent (I think it might have been a last dit or dah that the keyer kept sending after I let up the footswtich), so I would either recommend a time sequenced relay or to add protection diodes and a current limiting resistor to the output of the preamp. The latter is not really a good idea for IMD reasons, but I did it anyway. The interlock is still a good idea because it's possible to blow the current limiting resistor out by transmitting into it. So that's the setup, how well does it work? I initially tested it on an AM broadcast station about 10 miles away and adjusted the termination resistance for best F/B. I got a decent pattern that way, for sure. Pretty textbook besides the distortion at 260 degrees in the plot. 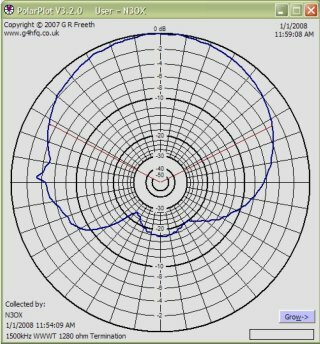 The pattern was taken with G4HFQ's Polar Plot from G4HFQ's Site. Left: 1500kHz WWWT pattern, 10 miles out, 1280Ω termination. Right: 160m pattern @500ft, 1280Ω & 940Ω termination. The small distortion on the pattern in this WWWT plot turns out to be more severe from sources coming from other directions. WWWT is northwest from my location. The plots on the right show the effect on a source at 1843.2kHz (TTL oscillator driving an 8 foot whip) more to the north-northeast. The ripple is of no consequence; that's just the pinger's pulse kicking on and off smoothed out a bit. I use a modulated source so it's easy to tell that I'm really listening to what I think I should be listening to. This plot though shows a major distortion of the plot on the right half of the pattern. It's not obvious but I think that's the same direction as the WWWT distortion. I'm not sure what the source of the distortion is at this point, but there are several metallic objects including a metal shed roof and a chain link fence. The flag is only a few feet from the house and the shed. At any rate, there are some significant issues from a pattern perfection standpoint but the pattern I end up with does show some useful directivity anyway. Over time I'm going to try to detune or eliminate close by conductors and see if I can improve things a little. I have a suspicion that radials might have something to do with it, but there's a lot of stuff close by as you can see in this picture. On the upside the antenna nearly always has better S/N ratio than the transmitting antenna and is really worth having around. The variable termination does work too. 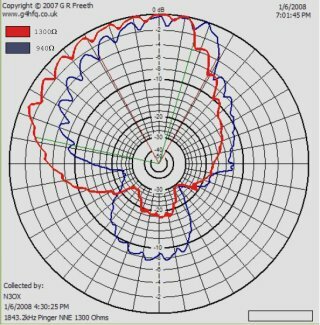 The EZNEC modeled termination for optimum nulling at 0 degrees elevation is 940 ohms, but as is obvious in the plot, 1300 ohms is better. Additionally, changing the termination moves deep nulls around on the back of the antenna. CHU on 3330kHz probably comes in at a fairly high angle and needs a different termination than the optimum F/B on the second harmonic of my TTL pinger around 3680kHz Changing the termination to a fairly low value also moves nulls out more to the sides of the antenna, which allows sacrifice of some overall directivity for nulling of local noise that's not off the back of the antenna. So there are some issues with using RX antennas on a small suburban lot, but in my opinion it's absolutely worth a try. 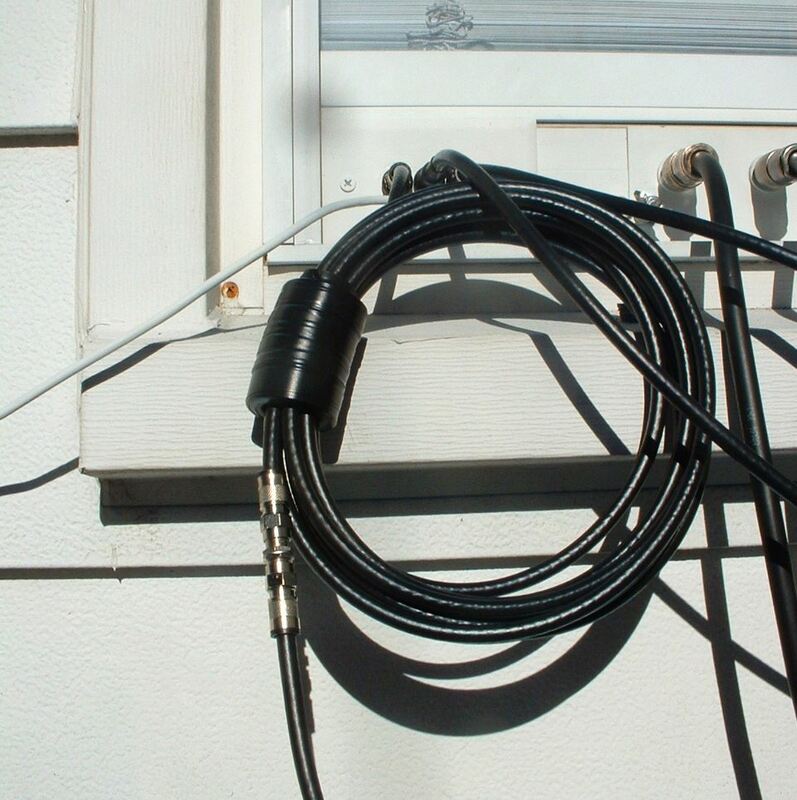 Keep common mode isolation in mind and measure the pattern and tweak things for best results, and it's a useful way to hear on the low bands without running beverages across the neighbors' lawns!